It's every fashion-loving woman's nightmare! There's nothing like it. Turning up to a big event, feeling like a goddess; your hair is set, your make-up is perfection. - that gorgeous guna that took you weeks to find - is absolutely on point. There's no stopping you. Only once you arrive, you see you weren't the only one with a keen eye for a stylish getup. No worries, you'll just avoid that other similarly clad lady, maybe have a joke about it later.. But wait! Isn't that somebody else wearing your unique gown, in a different pair of heels (yours are nicer at least). And hang on. Another? And no that can't be... Another? This is the predicament six (SIX) ladies found themselves in when they rocked up to their mutual pal's big day and discovered that their personal style wasn't so personal after all. - if she qualified for a gift voucher with all the advertising she would give them. 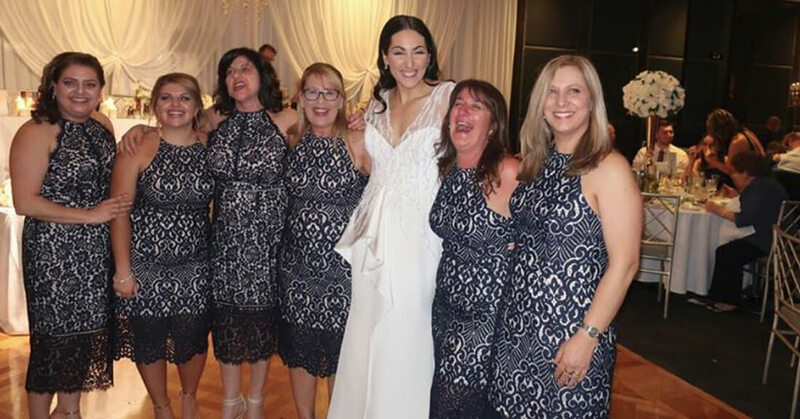 "You really should start a bridal registry so that your customers can enquire whether anyone else has purchased one of your dresses for the same event," she suggested. "No we are NOT the bridesmaids just the guests - think I deserve a gift voucher for all this advertisement." Speaking to her local paper the Daily Telegraph, the Aussie bride said "I've heard of two women, maybe three, wearing the same dress, but six? You couldn't make it up." "At first there were a few dirty looks among the girls in the same dress who didn't quite know whether to laugh it off or go home and get changed. "In the end we all cracked up about it. It's every girl's worst nightmare, what else can you do?"